The Reivo "Short" band is a great elasticated training band for ball games, athletics and swimming. The Reivo "Short" band has lots of different uses. With just one band you can train strength, speed and endurance. Its high-quality finish without any metal or hard plastic parts allows children and teenagers to train worry-free using the elasticated band. It can also be stretched out to cover longer distances in a large sports hall. Thanks to the practical quick-release system at both ends, the Reivo "Short" band can be easily attached to other Reivo bands. The Reivo "Short" band offers a great variety of different training opportunities. Schools like to use it as a replacement net in badminton or volleyball. Numerous courts can be set up quickly as many children can play on one net at the same time. The Reivo "Short" band is also used in athletics and gymnastics, as a hurdle or a high-jump bar and to improve jumping action, for example. Great product: Why not order the Reivo belt at the same time? We recommend this product for people with larger waists. 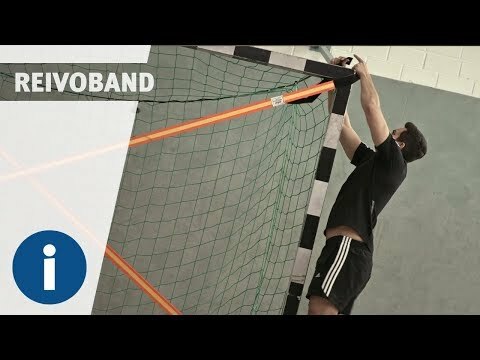 Practise and train with just one band – the Reivo "Short" band from Sport-Thieme.